Get a load of THIS brilliant album! Jazz meets chic in this mish-mash of electronic cool. Association P.C. was founded in 1969 by Dutch keyboarder Jasper van’t Hof along with the Dutch drummer Pierre Courbois and the German guitarist Toto Blanke. The bassist was sometimes the Dutchman Peter Krijnen, sometimes the German Sigi Busch. Association P.C released their first record “Sun Rotation” in 1971. The band produced a synthesis of jazz, rock and avantgarde music reminding sometimes Soft Machine and was highly acclaimed at the Berlin Jazztage of 1971.”Eighty percent of Association P.C. was electronics”, Jasper recalls. In 1972 the band released their second record “Erna Morena”, the last with Jasper van’t Hof who left the band to form Pork Pie with Charlie Mariano and Philip Catherine.On the 1973 release “Rock Around The Clock”he was replaced by German pianist Joachim Kühn. The record moved away from the Canterbury oriented sound and integrated free-jazz elements. 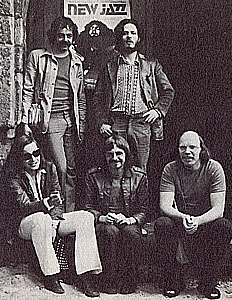 Their last record “Mama Kuku” (1974) contained live recordings from 1973, on which the band was joined by American flute player Jeremy Steig. Association P.C. continued to tour until 1975. I’ve said it before and I will say it again. Anything that Lol Coxhill is willing to get involved in will rip you out and start you over. From the liner notes: “The term “free””, in the context of “freeform music”, “after being used in the 60s mainly to mean “beyond tonality, melody and metre”…now stands for an entirely new quality of musical freedom in the music of Association P.C….it signifies really sovereign mastery over all musical areas.” Judging by what I saw, I have no grounds to dispute that statement.